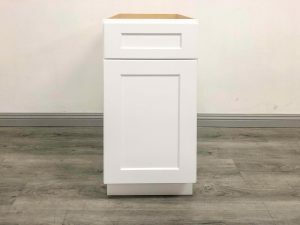 For this article, I will be reviewing Kitchen Cabinet Depot’s White Shaker Kitchen Cabinet, the Single Door Base 15 model. While all the kitchen cabinets from Kitchen Cabinet Depot are similar, there was enough variance to check for consistency among the different models. 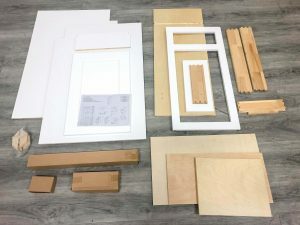 The Door and Frame of this White Shaker, according to the Kitchen Cabinet Depot website is made of HDF (High-Density Fiberboard) or hardboard which is a form of composite wood. This is stable material that is found in many RTA kitchen cabinets but like other composite woods, this is prone to absorb water and may warp under exposure to excessive moisture. When this arrived in the package, this part of the cabinet was very well wrapped and protected. I got a distinct feeling that I was unwrapping a completely new product, but part of me wondered if the items in this packaging were so new, that they did not come from the same area as the rest of the cabinet. The appearance is near perfect but there is an unexplained splotch of paint at the top of the frame that keeps it from being flawless. This is the part that I scrutinize the most because even in this base cabinet, this is the central focus of the cabinet, especially in a shaker style cabinet. Even more particularly true of a shake style cabinet that is all white so the middle rectangle is the only form of design on the entire cabinet. The door finish of this White Shaker did not have any cracks and the paint was thick enough to cover any showing of the wood grains. However, there are a couple of spots where the paint was thicker than others leaving a bit of excess paint at the backside of the door. With that exception, this is nearly flawless appearance and a clean appearance at the front of the cabinet door. The Kitchen Cabinet Depot White Shaker has a laminated natural interior which is different from the exterior face of the cabinet. 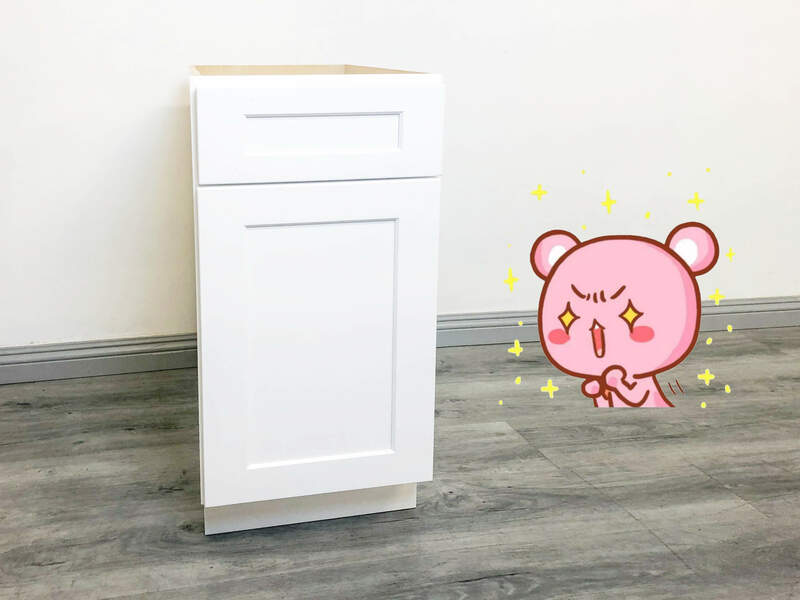 The surface shows natural light wood grain for the interior, which just based on this base cabinet, it means that it’s possible that if you ordered multiple base cabinets there may be a shade difference among the natural interiors. According to the website, there is a UV coated natural interior, but it doesn’t feel quite smooth to the touch. The White Shaker has a front frame that is ¾” thick and the side and back birch plywood panels when measured are 7/16” each. The box feels quite sturdy and while most of the concentration is clearly on how this looks on the outside, the fact that the side and back panels are not quite ½” inch goes against this White shaker. 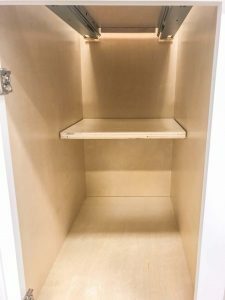 The back panel is at least the same thickness as the side panels; in other RTA cabinets, the back panel is given even less consideration because it is the least visible portion of the cabinet. The bottom of the drawer is a nice 3/8” thick panel, which is standard for many other RTA Cabinet drawers. The interior is a beautiful wood grain that feels smooth to the touch; the sides of the drawer are a nice thick 5/8” inch. 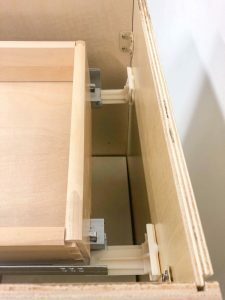 When putting the panels of this drawer together in a dovetail joint, it required more than a rubber mallet, it required a little more patience since the joints did not interlock nicely. Whenever one corner of the dovetail would connect, another corner would almost pop out, which isn’t a good sign of a clean dovetail joint. The dovetail was the only flaw in this drawer assembly; everything else about the drawer was great. As mentioned earlier, the drawer has a full extension, but not without some friction when the drawer goes from full extension to close. There is an adjustable half-shelf, that is adjusted by shelving pegs, two on either side of the shelf. They were very easy to place and relocate when needed. However, it is only a half-shelf rather than a full shelf so the odds of stacking random pots and pans in that space is highly likely. The storage of the drawer space is 2 ½” deep, which feels shallow and is more ideal for storing flatware. Based on the opening of the drawer space, there will not be much room other than that. 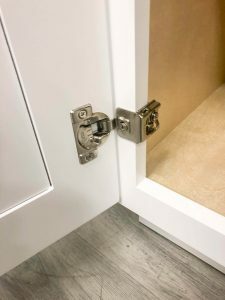 The hinges are a critical part of the kitchen cabinet because non-functional hinges make this entire cabinet no different from having an open shelf. So careful attention is paid to the quality of these hinges. 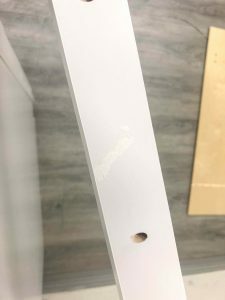 The hinges for the Kitchen Cabinet Depot White Shaker insert neatly into the sockets for the cabinet door and adhere nicely to the side of the cabinet frame on the side of where you want to open your door. This cabinet has soft close hinges that activate in the last few hinges as the cabinet door shuts. In a bit of playfulness, I tried to see if I can shut this cabinet door so hard that I could smack it against the frame before the soft close mechanism triggers. The drawer sliders are mounted beneath the drawer box which makes for a nice gliding sensation for the drawer for this cabinet. However, I have noticed that when you pull this cabinet drawer to its full extension, you can feel the friction when you shut the drawer. 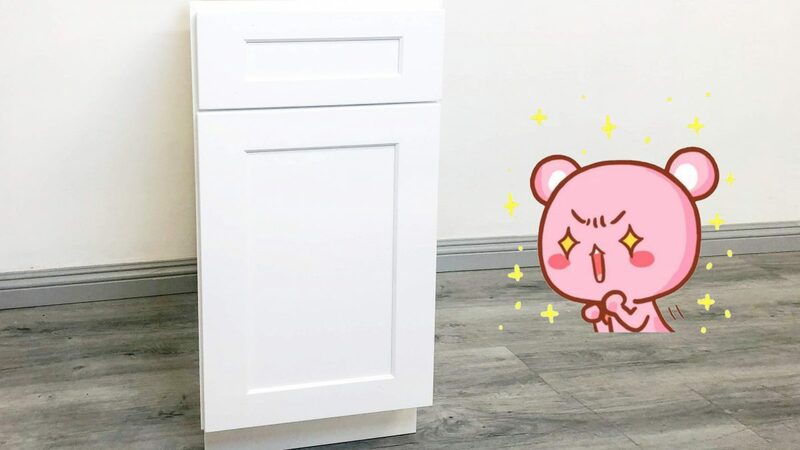 However, there is a soft close mechanism attached to this drawer that will catch the drawer inches from the cabinet box and will soft close no matter how much force you put into it. 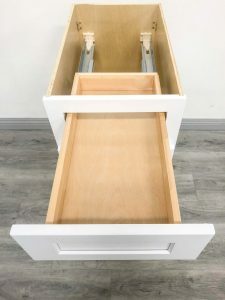 With the sliders mounted beneath the drawer box, the chances of this drawer falling off its railings and being an inconvenience are close to none. 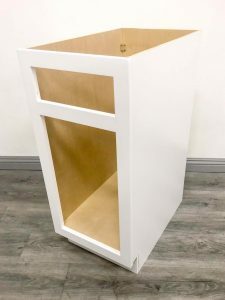 The connecting parts that are included are strong and well-fitted for the constructions of this White Shaker cabinet. However, in the packaging, some of these fasteners of different types are packaged together and the instructions don’t specify which fasteners are to be used where so you will only know based on the experience of building previous kitchen cabinets. Some of these screws were so similar in appearance that I had to spend time figuring out if I was using the right screw. It turned out these screws were interchangeable, but this is something no one should be worrying about. 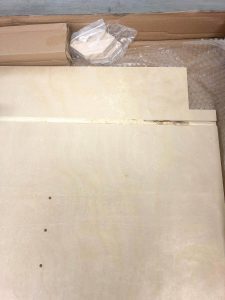 The package arrived in firm shape with bindings to keep the box extra secure. 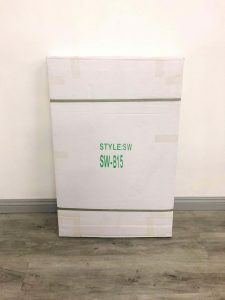 Upon opening, all of the contents were wrapped in one large sheet of bubble wrap and all of the pieces that were face pieces like the door, and drawer front panel were packaged with more attention. All the smaller parts were inside of boxes, including the pieces associated with the sliding drawer mechanisms. Packaging is nearly flawless with the exception of one thing: the groove of one of the panels was filled with sawdust and it got everywhere during the unpacking. For the sake of the assembly, the instructions were followed according to the diagrams, which only had pictures, no text. It did not explain which fasteners were used in the assembly and almost presumes that you’ve done this before. While I have assembled similar cabinets (literally similar, since this resembles the Kitchen Cabinet Depot Antique Shaker), the diagrams are TINY and do not explain a very important section which was how to install the locking devices beneath the drawer. While I have assembled this drawer before, the instructions alone were not clear enough to be understood. Unlike the other Kitchen Cabinet Depot cabinets, all the indicator holes were aligned which helped immensely with the process so that is extra points to this score. I did send an email with a few basic questions and a reply was sent six hours later. So it looks like your best bet is to either call them on the phone or do the live chat. So while according to the Better Business Bureau, Kitchen Cabinet Depot has an “A” rating, there are only a few negative reviews and no positive reviews, which is not unusual since most people tend to make complaints to the BBB rather than leave glowing remarks. However, the KCD Yelp! review has the exact same negative comments (as in copy and pasted) so either BBB is sourcing from Yelp! or vice-versa. As far as all the Kitchen Cabinet Depot cabinets are concerned, the White Shaker is the best quality of the bunch. Higher marks were given because of the great initial impression from the good condition of the packaging to the quality of the individual parts as well as the ease of assembly. While there is room for improvement, this is the most solid of the kitchen cabinets that we were able to review from Kitchen Cabinet Depot.